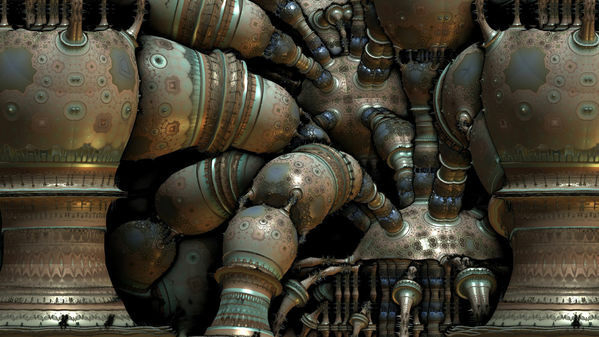 He has a Deviant Art Gallery too with more examples of “steampunk” mandelboxes. On DA he goes by Hal Tenny which sounds like a real name. He shares, he cares, he posts parameter files! What a wonderful fractal artist and human being he is. Let’s hope fractal fame doesn’t perturb him or divide him by zero. I take it he uses Jesse Dierks’ Mandelbulb 3D, a freeware Windows 3D fractal program available for download here on Fractalforums.com. 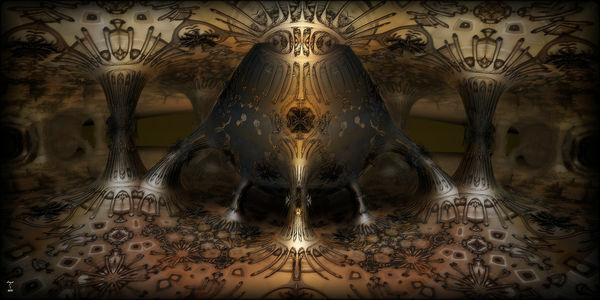 He thanks the well known 3D fractal artist lenord for sharing the parameters from his recent image Spudsville posted on Fractalforums.com. You can see the similarities; the shapes, patterns, patina of metallic corrosion on the big, central “tuber.” But you can also see that lenord’s image is different than haltenny’s in the rendering of it and the some of the parts of the shapes and choice of imagery. Also, if you follow lenord’s regular uploads to Fractalforums.com like I do, you’ll notice that haltenny’s image doesn’t share lenord’s characteristic style of symmetery; something that I find gives a strong design aspect to most of lenord’s work. What this all leads to is the observation I’m sure we’re all making here that there’s a great deal of creative potential to these 3D mandelbox programs that comes from each individual artist’s choice and experimentation with whatever can be experimented with and that sharing parameter settings can lead to even more discoveries and not just soulless imitation. 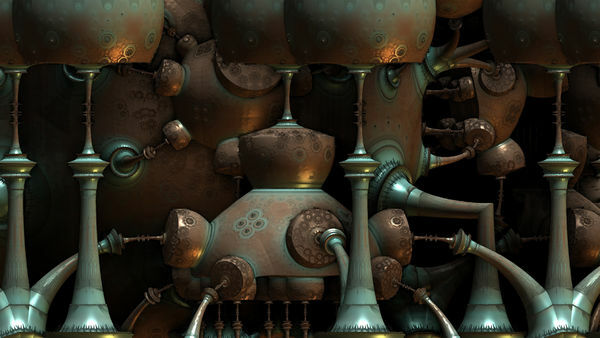 I’ve not seen anything quite like haltenny’s steampunk mandelboxes and they’re a real example of how powerfully creative these 3D fractal algorithms can be when it comes to making graphically complex and photo-realistic works. It’s almost like a graphical version of a piano on which almost any type of tune can be played with seemingly never ending possibilities for song writers. I wonder if there’s any other haltenny’s out there amongst the great, looming shadows of Deviant Art? It’s easy to get lost in the shadows. Hals images I must say are great tweaks, beautiful work with coloring and composition!